Between Netflix accounts, Amazon Prime, Costco memberships, magazine subscriptions and gym passes, it can be pretty tough to keep track of all your subscriptions – and that's where Butter comes in. Butter is a service that helps you manage all your paid subscriptions and memberships in one place and save money in the process. They make it super easy to track everything you've signed up for, and they give you 1% cashback on your eligible subscription fees! They just launched in beta fairly recently, and they're still growing as a service. But why not sign up now to start saving money right away? Plus, if you sign up before May 15, 2018, Butter will send you a link to a payment card that'll get you a $2 Amazon.ca e-gift card! To get started, you'll need to create an account by entering your name and email address and creating a password. Make sure you use an email address you check regularly and tick the box at the bottom of the signup form to subscribe to the Butter newsletter. That way, they can send you deals and tips for saving money. This step can be a little tedious, but it's well worth it to link every single one of your accounts and cards to Butter, since that's how you'll make the most money back! After you confirm your email address and sign in to your account, you'll be able to search for and select your financial institution(s). Once you've linked all your accounts, Butter goes through your transactions to figure out which subscriptions you have. Everything that's an eligible subscription in the Butter database will then show up on your account's subscription dashboard. 4. Start earning 1% cashback on all those subscriptions! 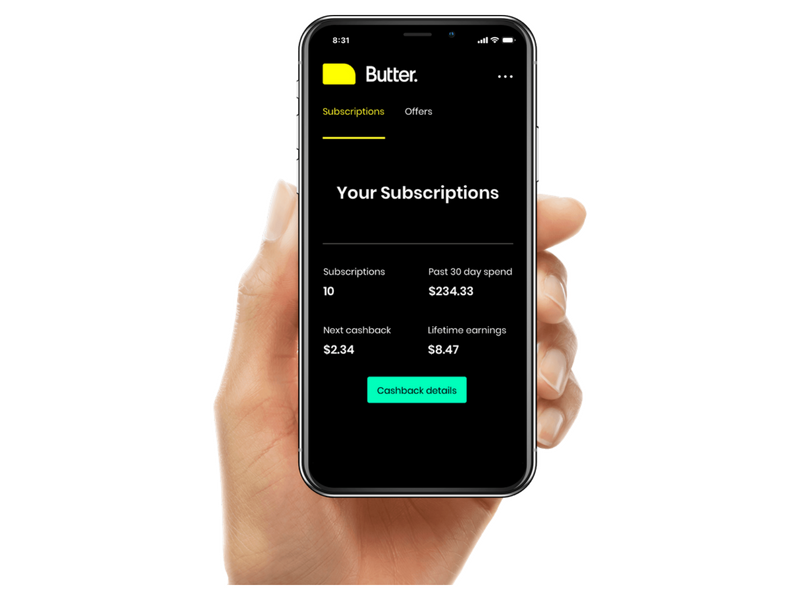 Once that's all set up, you'll start earning 1% of your total subscription costs for every eligible membership listed in your Butter subscription dashboard. Right now, they pay you via Interac e-transfer every two months to the email address associated with your account – so make sure you sign up with one you'll check! Which subscriptions does Butter track? Right now, Butter can help you manage all kinds of different subscriptions, including streaming service accounts, gym memberships and magazine subscriptions. Some of their most popular memberships and subscriptions you can track and earn cashback on include Netflix, Spotify, Amazon Prime, Dropbox and Costco – but there are many more! If you don't see a subscription on your dashboard that you think should be there, you can email Butter at help@justbutterit.com. They're just getting off the ground and still adding to their subscription list, so expect their list of eligible subscriptions to grow as time goes on! One of the best things about Butter (besides the fact that they basically pay you to watch Netflix) is that you get to see all the subscriptions and memberships you have in one place. So if, like me, you tend to sign up for free trials and then forget to cancel them, this can come in really handy. You can view all your active memberships at once and get rid of the ones you don't use (which saves you even more money)! What's even better is that for certain subscriptions, Butter can actually link you directly to your account, so you can do things like update your payment information, modify your account details and more. All Butter users receive 1% cashback on eligible subscription fees, but you can double that if you have an RBC Visa Platinum card! If you sign up for a card, just make sure you add it to your Butter account. And if you already have the card, link it up! Either way, the 2% will be automatically calculated when it's all set up. In a nutshell, Butter is a service that organizes all your paid subscriptions in one place and gives you 1% cashback on things you already pay for! Does it cost anything to use Butter? Nope! Butter is absolutely free to use. Butter accesses your consumer data and then makes money when their business partners pay to put offers, subscription deals and advertisements in front of you. Can I use Butter even if I don't bank with RBC? While Butter is run by RBC Ventures Inc. (a subsidiary of Royal Bank of Canada), you don't need to have an RBC account to use Butter. But no matter who you bank with, just remember to link ALL your credit and debit cards to get the most perks! In a word, yes. Butter uses a third-party accounts aggregator called Yodlee to connect all your accounts and store your login data. This means Butter doesn't have access to your password, and Yodlee keeps everything safely encrypted. What if I already get cashback with my credit card? One of the best parts about all this is that Butter works on top of whatever cashback benefits you already have. So if you already earn a kickback with your current credit card, you'll get an extra 1% back in addition to that!